Dan Willard grew up in Manhattan Beach, California and began musical training with singing lessons at age seven. At age ten he started playing clarinet in school. In high school he added the saxophone and began taking private lessons. While still in high school he started playing sax with The Fabulous Esquires Big Band and formed his own rock band The Earwigs in which he sang lead vocals, played sax, synth, and co-wrote the music and lyrics. After high school Dan attended UCLA as an English major while continuing private lessons and playing with The Esquires and The Earwigs. In 1981 he quit school and traveled to Tennessee with his girlfriend to live in a commune called The Farm. Things didn’t work out at the commune so he and his girlfriend ended up living in a small community near Waynesboro, Tennessee for a year. While in Tennessee Dan picked up the flute, the guitar, and worked on songwriting. Upon returning to Los Angeles Dan continued playing guitar, writing songs, and briefly revived The Earwigs. 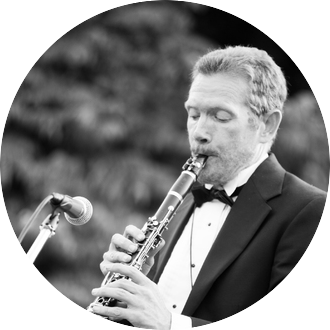 In 1985 he attended CSULB where he studied music theory, piano, clarinet, and played sax in the jazz band. In 1986 he began studying Lyle “Spud” Murphy’s five year composing and arranging course with a private teacher. In 1988 he attended El Camino College playing sax, clarinet, and flute in various ensembles while studying jazz improvisation and computer music production. Around this time he also began playing professionally with local orchestras such as the Torrance Symphony, the Bellflower Symphony Orchestra, Southeast Symphony, the Long Beach Ballet, big bands, Dixieland bands, and pit orchestra for musicals. He also co-founded the West Coast Woodwind Trio, which performed classical selections from the standard repertoire as well as his own arrangements of popular music. He also began teaching private lessons on clarinet, sax, and flute at the La Marca Music Center in Torrance, The Gray School of Music in San Pedro, and at his home. After finishing Lyle Murphy’s course in 1992 Dan moved to Ojai, California in order to concentrate on composing and recording his own music. Eventually he began teaching and performing again. He was assistant music director at Besant Hill School from 1999 to 2003, has taught private lessons at Ojai Valley School since 2002, and taught private lessons at The Thacher School since 2007 in addition to teaching from home. He has performed regularly in musical productions at Nordhoff High School, The Thacher School, and the Ojai Art Center. He joined the Bruce Solow Big Band in 2004, which became The Ojai Big Band under his leadership after Bruce passed away. In 2001 Dan took part in a recreation of Benny Goodman’s breakthrough 1938 Carnegie Hall concert, transcribing many of the recordings and playing Benny Goodman’s solos. A concert took place in Ventura and was subsequently recorded in a studio. Around this same time Dan also began playing with The Untouchables, a Dixieland band and Ulysses Jasz, another Dixieland band based in Santa Barbara. Both bands made albums which feature Dan’s singing, clarinet, and sax. In 2006 Dan founded Ojai Music Service, which is now Dan Willard Music Service, in order to promote the various bands he leads, fellow musicians with whom he has worked, and his private lessons service. He currently lives in Oak View, California and when he’s not busy with music enjoys watching and reviewing films for his site FilmsByTheYear.com.